So let's talk about the sequel to John Carpenter's Halloween. You know it as Halloween II. Or, as the trailer puts it: "More of the night He came home". Yes, that's what it really says, and it should give you a pretty good indication of the kind of sequel Halloween II is. It is, after all, a movie John Carpenter drank his way through writing. Believe me; it shows. 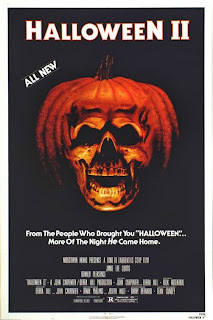 The Cap'n used to really like Halloween II, and without watching it for several years, I held it in pretty high regard. It was one of the first ten dvds I ever owned (along with Ghostbusters, Mallrats, Jaws, and Evil Dead 2: Dead by Dawn) and I've held it fondly in my memory, at least until three days ago. But I'm getting ahead of myself. I'm going to err on the side of "yes, Cap'n, we've seen Halloween and Halloween II," so recapping the film is not necessary. Instead, I'm going to share my revised thoughts on the film, pros and cons, then provide a "wish list" of sorts for things from Halloween II I'd like to see in Rob Zombie's H2. - The opening recaps the last five minutes of Halloween quite nicely for audiences (it was three years between the first and second film) and quickly gives urgency for Dr. Loomis to find a very alive Michael Myers loose in Haddonfield. - Starting and ending the film with "Mr. Sandman" is an inspired move. The song can, under the right circumstances, be rather ethereal and creepy (see Nan Vernon's version in Zombie's Halloween remake.) As it plays over a crane shot re-introducing the Jarvis house, you're in the frame of mind that this Halloween is anything but nostalgic. - The early way Michael stalking scenes are handled well; a combination of first person perspective shots and well placed lighting that reveal Myers at exactly the right time. My favorite is when Michael slowly un-dissolves from the darkness in Dr. Mixter's office. The entire sequence with the Security Guard, Mr. Garrett, is also well executed. - Some of the kills are pretty cool, particularly the inventiveness of the hospital murders. I'm thinking specifically of the "Tub" sequence, the hypodermic needle kills, and the blood drawing of Mrs. Alves. - For a while, it looks like Halloween is going to address not merely Laurie and Dr. Loomis, but Haddonfield in a broader sense. Much of the first half of the film is about the way the citizens react to the murders of Halloween and the possibility that a killer is loose in their city. The "wake" for Annie at the Myers house does hint at a deeper movie than Halloween II ends up being, which is unfortunate. Had they not dropped so much of that depth, the film may have been better. - I love that in order to throw a red herring into the Loomis chase of Michael that Halloween II just arbitrarily kills a guy who coincidentally looks exactly like Michael Myers. What's more, it's not enough to pin him against a truck with a police car; there has to be a huge explosion and lingering shots of faux-Michael burning to death. - Speaking of burning, I do like the final shots of the film: one of Laurie in the ambulance and then a comparably lingering shot of real-Michael facedown in the hospital, burning to not-death (as we discover in Halloween IV). Now, unfortunately, there are the cons. - Many of the things I like about Halloween II are undone by its last 40 minutes, which are almost exclusively in the hospital. Key to the problems of Halloween II is the fact that Laurie Strode has nothing to do. So miniscule is her role in the film that the script frequently finds excuses for Laurie to pass out, lapse into a coma, or simply hide out when no one is looking for her, just to get her character out of the film. - As a result, the "cat and mouse" elements of the film with Michael and Laurie, when they finally do happen, are awkward and unnecessarily drawn out. Since the geography of the hospital is never clearly established (I think we're supposed to believe that the Maternity Ward, Rehab Room, and Laurie's room are on the same floor of a three story hospital), the two chases involving Laurie and Michael just don't make any sense. _ The other kills Michael commits in the hospital are also riddled with sensical errors. While drowning the nurse in a "boiling" tub, Michael's right hand spends as much time in the "scalding" water as her boiled face does, yet it's perfectly normal throughout the movie. In fact, the hand Michael puts in the boiling water is the same one he wields his knife with, so you see quite a bit of how not "scalded" it is. The one character (Paul) who doesn't die in the hospital has a great fake out that never gets a payoff. He slips and falls in a puddle of blood, and it splashes up on his mouth, making Paul look like another victim. Rather than use this to any effect in the chase scenes, Paul simply appears later, getting into the exact car Laurie happens to be hiding in. Then, he inexplicably passes out on the horn and disappears from the rest of the movie. One or two of these things might be acceptable by "slasher" standards, but to come one after the other for 40 minutes is too nonsensical to accept. - Of course, there are a lot of things in Halloween II that don't make sense in a "bad" way. I can live with the random killing of a teenager to keep Loomis and Laurie apart, but there are a lot of "convenient" things that pile up on top of each other in such a way that you can't suspend disbelief near the end. Among them: Laurie is unable to scream for Loomis until after he goes in the hospital, the extent of her injuries change depending on how convenient it is for her to escape, Loomis is given a crucial piece of information while being dragged out of Haddonfield by a Marshall and then decides to commandeer the car at gunpoint, so he can finally confront Michael, knowing the truth about why he chose Halloween to return. "Geez! Don't you see what he's doing here in Haddonfield? He killed one sister fifteen years ago and now he's trying to kill the other!" The line is delivered so flatly by Donald Pleasance that I had trouble not laughing. Carpenter's script sloppily handles this "twist" by introducing terrible flashbacks while Laurie is in the hospital that deliver ham-handed lines like "Laurie, I'm not your real mother" and a shot of young Laurie visiting Michael in the asylum. You know, the same asylum that Dr. Loomis spent fifteen years studying Michael, and yet he a) never saw Laurie visit Michael, and b) doesn't know about this extension of the Myers family because "it was sealed by the Governor two years after Michael was locked up to protect the Strodes." Suddenly I find myself longing for Daeg Faerch calling baby Laurie "Boo" before slaughtering his family of trailer trash. - I'm really hoping that this "Hobo" Michael plot device means that we're going to get more of the citizens of Haddonfield in H2. Certainly, considering that the cast has only grown with more people in town (including Margot Kidder, Bill Moseley, Daniel Roebuck, Mark Christopher Lawrence, Caroline Williams, and Howard Hesseman), I can hope that the scale of H2 reflects the promise abandoned by Halloween II. - Truthfully, since he's already hinted at the hospital massacre, is it too much to ask for the arbitrary kill to throw Loomis off of Michael's trail? It's such an out-of-left-field move for Halloween II that I can picture Zombie borrowing it. - Could there maybe be a twist where Laurie isn't Michael's sister? Maybe it's Annie instead? That's so dumb it might actually work! - While it's not technically from Halloween II, is there a way to incorporate the police reaction from Halloween IV? One of the things I loved about that movie is that instead of the local cops not listening to Dr. Loomis, instead they mobilize to keep everyone safe and it still fails. It was a great twist on the slasher convention from a sequel that's honestly better than part II. - One final request that I know won't happen, but could H2 at least try keeping Loomis and Laurie together for more than three minutes? It's not that I find the two of them combined are much more effective (I mean, Loomis shoots Michael 13 times and Laurie shoots him twice to no avail) but to be honest I minded Scout Taylor-Compton less when Malcolm McDowell was also on-screen. You know what? It almost doesn't matter if none of that happens because we have "Ghost Deborah Myers", played by Sheri Moon-Zombie, which I still contend is crazy enough to make H2 vaguely watchable. While it shouldn't be that hard to make H2 better than Halloween II, I remain skeptical.